Provide comfort for the family of Lanny Cullum with a meaningful gesture of sympathy. A kind and caring man, Lanny Cullum passed away peacefully at St. Joseph’s Villa on Wednesday, April 3rd, 2019 with his daughters by his side at the age of 81. Loving husband to Patricia Cullum (née Comerford) predeceased 2018. Caring dad to his three girls: Karen currently residing in China, Nanci (Geoff McNabb) residing in Hanmer, and Susan (the late Randy Preiss) residing in Carleton Place. Adoring Papa to seven grandchildren: Clayton McNabb (Christine), Ben Royce (Kirstyn), Alex Royce (Maddi), Kristy Bodson (Mike), Megan Cullum (Randy), and Chris Royce, and seven great grandchildren. Son of the late Earl and of the late Irene (née Pokrandt) Cullum. Dear brother of Eula Van Horn (the late Glen Van Horn) of Sudbury. Predeceased by his brothers Wayne Cullum and Terry Cullum. Special brother-in-law to Jane Keown (Guy) and Rosemary Aubrey (the late Ron Aubrey) and predeceased by his step-brother-in-law Sheldon Macartney (Glenn). Loving uncle to many nieces and nephews. 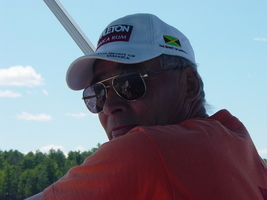 He also leaves behind family in Ottawa and lifelong friend Fred Wharton. In his teenage years, Lanny worked as a Mechanic and at the Sudbury Canoe Club before starting his career at Bell Canada, which included being an active member of the Pioneers. Lanny volunteered with the Legion to sell poppies for Remembrance Day and also volunteered as a driver during the Special Olympics and during the Steve Fonyo run across Canada. Lanny had a passion for cars, enjoyed curling and loved spending time at his “camp” on Trout Lake. In retirement he enjoyed his home in Bradenton Florida, his Tuesday breakfasts with fellow retirees, and his “Thursday meetings” at the Lockerby Legion Branch 564. Lanny was blessed with a long-time circle of close friends. The family would like to thank the kind and attentive staff at both Southwind Retirement Residence and St. Joseph’s Villa. Special thank you to Dr. Susan Lane and Dr. Jason Sutherland and their staff for guiding us through our father’s journey with Lewy Body Dementia. Friends may gather at the funeral home after 1:30 pm on Saturday. Cremation at the Park Lawn Crematorium with burial alongside his wife Patricia in the Civic Memorial Cemetery this summer. If you wish to honour Lanny’s memory, donations to St. Joseph’s Foundation Sudbury would be appreciated. To send flowers in memory of Lanny Cullum, please visit our Heartfelt Sympathies Store. Burial alongside his wife Patricia in the Civic Memorial Cemetery this summer. Consider providing a gift of comfort for the family of Lanny Cullum by sending flowers. We encourage you to share your most beloved memories of Lanny here, so that the family and other loved ones can always see it. You can upload cherished photographs, or share your favorite stories, and can even comment on those shared by others.